Whether or not it’s fair that THE TWILIGHT SAGA has become the de facto standard for contrast and comparison when folks talk teen paranormal romance, writer/director Richard LaGravenese (screenwriter of, among other things, Terry Gilliam’s THE FISHER KING) and Alcon Entertainment should be glad that it’s the case. 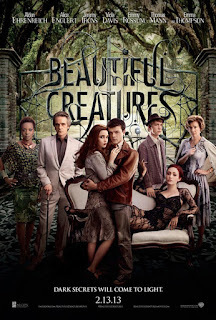 By typical cinema standards, LaGravenese’s witch-populated adolescent hormone engine BEAUTIFUL CREATURES is a plodding, messy, heart-on-sleeve tangle of supernatural gibberish bolstered by occasional flashes of wit and a cauldron full of good intentions. By TWILIGHT standards, it’s practically Powell and Pressburger. Set in Gatlin, a puny Southern everytown that’s primary exports are civil war nostalgia and Christian values, the film follows emotionally and intellectually frustrated high school junior Ethan Lawson Wate (Alden Ehrenreich), who the filmmakers show us is smart by having him say he likes Kurt Vonnegut, and having him ask other people if they like Kurt Vonnegut. Desperate to flee the confinement of his small town, Ethan suddenly finds life a bit more livable when the like-minded Lena Duchannes (Alice Englert) moves to Gatlin and asks him if he likes Bukowski. The only problem is that Lena is actually an immortal witch whose impending 16th birthday will find her soul claimed by either the force of good or the power of evil. Even ignoring CREATURES’ genre pedigree and source material (a series of YA novels), TWILGHT comparisons are inevitable: Lena’s cavefish-pale family of eccentrics are grimoire-toting analogs of Stephanie Meyers’ blood-swilling Cullens, complete with their paranormal secret and Spartan, ultra-modern interior design sensibilities. Still, with CREATURES featuring Jeremy Irons and Emma Thompson delightedly chomping up scenery as the nurturing patriarch and scheming matriarch of the Duchannes/Ravenwood clan, there’s no question as to which version of the Munsters-as-soap-opera I’d rather be reluctantly forced to sit through. Same goes for Ethan and Lena, whose natural, slang-dappled rapport and witty, disarming flirtations (I can do without the too-easy literary citations) leave little room for the chest-heaving angst and stony-eyed brooding of TWILIGHT’s Edward and Bella. But then almost everything else is a total ridiculous mess. Amid meaningless world-building jargon (the witches are called “casters”) and a kitchen-sink portrayal of magic that lacks any discernible internal logic (but offers plenty of bargain basement special effects), is an ongoing Civil War ghost story and interminable conversations about Lena’s sweet 16 “claiming” and subsequent destiny. All griping aside, underneath all the CG hocus pocus and turgid moralizing, I think CREATURES is trying to offer some pretty legit advice to its teenaged audience. Misguided though it may be, the films portrayal of small town society, religious tradition and, on the caster side, familial obligation, all point to a clichéd-but-worthwhile message about mastering one’s own destiny. 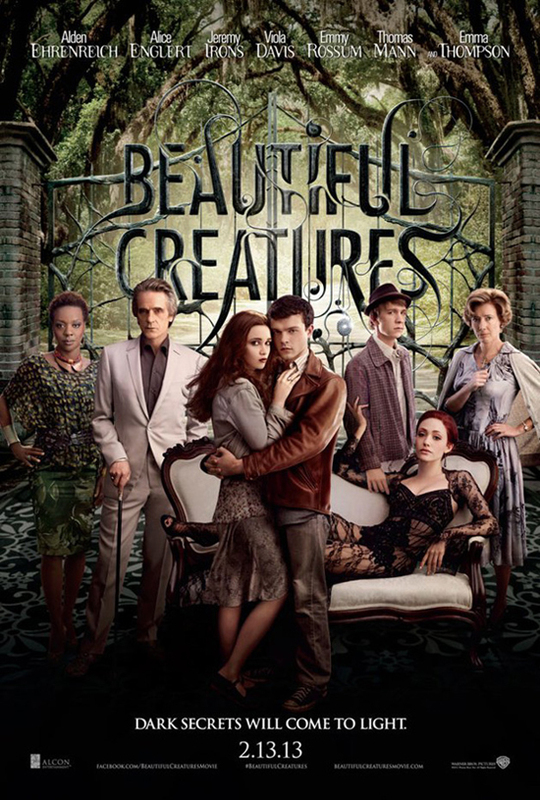 If TWILIGHT is all about Bella’s rush to lose her individuality to the cultural industrial complexes of marriage, monogamy and, uh, vampire politics, BEAUTIFUL CREATURES encourages its characters to explore the world and mess around and think for themselves. More specifically, buried in the morass of mind control spells and magic super tornadoes, all the bunkum about Lena’s pubescent claiming by good or evil, and its ultimate resolution, reads as a reassurance to young women: No one – not culture or religion or men or ancient hexcraft – has the right to define or control your sexuality. Even more admirably, the film uses its portrayal of a dark caster – Lena’s homicidally lascivious cousin Ridley (Emmy Rossum) – to demonstrate that, like many tools, female sexuality can easily be repurposed as a weapon, a self-imposed act that (as portrayed less obliquely by films like TEETH and JENNIFER’S BODY) can be as damaging to the feminist cause as societally imposed oppression. Is it a good message? Totally. Might it have been more effective if Lena and Ethan weren’t all co-dependent declarations of eternal love and big, sloppy kisses? Yes again.